In case you haven’t noticed in the last five years, we seem to have a Vulcan in the Oval Office. Spock is in charge. Oh, I know what some of you are thinking: we have an atheist/Muslim, Kenyan-born unnatural American in the White House instead. All that stuff about Barack Obama being born in Hawaii is faked, and even if it isn’t, Hawaii was barely a state in 1961, so he’s still not a naturally born American, and thus is not qualified to be president! The good news is that if Obama really is Mr. Spock, well, then we do have an imposter for a president, since anyone with knowledge of Star Trek canon knows that Spock is a Vulcan from the planet Vulcan. Not so fast! There is the minor matter of Spock’s mother Amanda, who happened to be human, which means Spock is a product of a mixed-species marriage. Curiously, Obama is a product of a mixed-race marriage. It’s unclear from Star Trek canon whether Spock’s mother Amanda was born in the United States, and it’s also very unclear whether in the 23rd century world of Star Trek there is a United States. It sort of sounded like in Gene Roddenberry’s imagination we had evolved past nation-states. However, Spock’s mother Amanda was white and spoke English with a flawless American accent. If she had a son on Vulcan and was a member of a 23rd century United States, why, Spock would be no less eligible for the presidency than Senator Ted Cruz (R-TX) is for being born in Calgary, Canada to American parents. Hmm. So I am going with this assumption, because President Obama is so much in mind and temperament like a Vulcan in general, but Spock in particular, that I figure Spock is real. He figured out a way to transport himself back to our time, got a little plastic surgery on his ears and otherwise inserted himself seamlessly into our national consciousness around 2004 when Obama made that famous speech at the Democratic National Convention. I mean, Obama is a dead ringer for Spock anyhow: tall, thin, highly logical and low key. I don’t know where the Barack Obama before that speech is, but I figure he is deep in a holding cell somewhere out of the way, probably in Guantanamo. Maybe he will be released after Spock finishes his term in 2017. Some rabid Christians believe in the antichrist, and many suggest that Obama is the antichrist. If the opposite of religious is secular, then Obama seems to qualify. It is true that he belonged to a predominantly black church in Chicago, but since assuming the presidency he and church have been strangers at best. He had not joined any of the local churches. His attendance is sporadic at best. Vulcans don’t need no stinkin’ churches. They are entirely logical and that certainly describes our president. Obama, more than any president I can recall, is a relentlessly pragmatic politician, which means that he is driven by logic, not emotion, just like a Vulcan. It is borne out in so many ways, but most importantly to Americans perhaps in Obamacare. It was an imperfect law at best but the main thing was that it could get through Congress, although it just barely made it out of Congress. When it arrived it quickly showed imperfections. However, its imperfections were not as important as the fact that Obama and Democrats in Congress had at least moved this political football down the field, an accomplishment that eluded many past presidents and congresses. Obamacare was certainly not the best health care legislation, but it was doable. It was the logical choice as opposed to doing what so many others had done: nothing. I find Obama/Spock’s pragmatism welcome. I see it not just in the Affordable Care Act, but in lots of other actions Obama/Spock has taken. The Iraq and Afghanistan Wars were good examples. Mr. Spock would look at these wars and say, “There is no way to win these wars. We need to get out quietly, set up some fig leaf governments that suggest that we care about the inevitable mess we’ll leave behind, but basically just go. We can’t afford them anymore.” And so we did. For the most part, even the Republicans who started these wars aren’t complaining. They have moved on to other issues that excite their base, like cutting spending in general. The Hindus recognize the god Shiva, whose job is basically to destroy things. This is because life is about change. If it didn’t change, it wouldn’t be life. Curiously, Republicans who claim to not want things to change seem to be channeling Shiva, eager to destroy pretty much all the social legislation of the 20th century. Obama/Spock seems to be trying to cope with change, to build on what has worked in the past to make for a better tomorrow, making him in some ways conservative. The Affordable Care Act demonstrates this principle at work: build a health care system on top of our existing private health insurance market to minimize the shock of change. It’s highly logical in the context of where we are today, which is why Obama/Spock supported it. Obama himself has repeatedly spoken about his intent on playing a “long game”. He tries to ignore the ups and downs of the moment and keep his eye on the far end of the field where the goal line is. Whatever it takes to move that ball down the field is fine with him. As quarterback though Obama prefers to rush instead of pass. He may start out with a pass, as he did with the Affordable Care Act, but once it proved politically impossible to get a single payer system through Congress he found it less risky to rush instead. He got his first down, which was the Affordable Care Act. Some other quarterback will get to the goal line: a single payer system. Obamacare makes this conversation possible in the future. Without it, it could not happen at all. 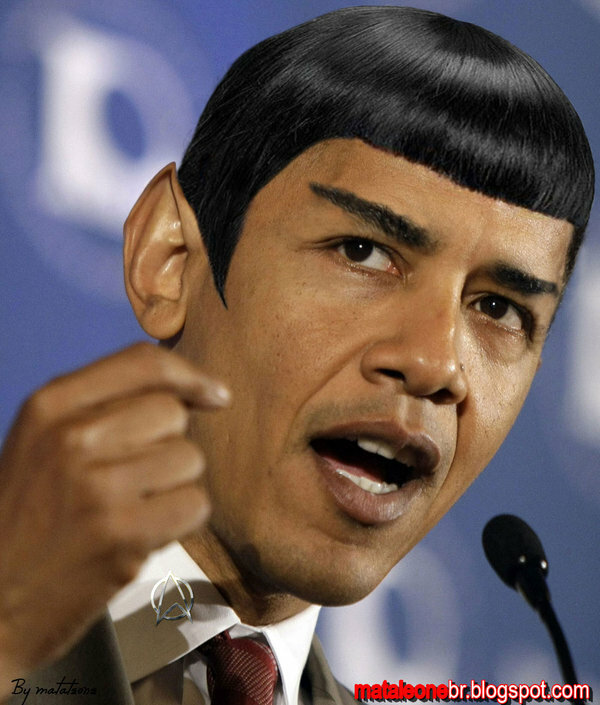 Obama is obviously not a perfect president, so the Spock analogy is imperfect as well. But I find his relentless pragmatism quite refreshing. At times it gets him in trouble, such as in national security matters with electronic eavesdropping and the use of drones to kill terrorists. Spock though would fearlessly make these choices. “The needs of the many outweigh the needs of the one,” he has said in various TV shows and movies. Disconnects like these can happen when you elect left-brain presidents. What is logical is not always what makes the most political sense, and it can come back and bite you from time to time. Overall though, I prefer a left-brain president to a right-brain one. We face terrible problems from overpopulation to climate change. No Messiah is going to come down from the skies to solve these for us. We made this mess, and only we can clean it up. We need clear thinkers and people of practical action to pull it off, if we can pull it off at all. The odds are very long. So I for one am glad that Spock is in charge. Love the post. But you might want to double-check your Hindu theology. Unless I’m reading you wrong, it looks like you may have gotten Vishnu mixed up with Shiva. If comments are screened, no need to make this public; I just didn’t want the one mistake to mar an otherwise insightful blog post. Thanks David. Obviously I need to brush up on my knowledge of Hinduism. I am correcting the post.